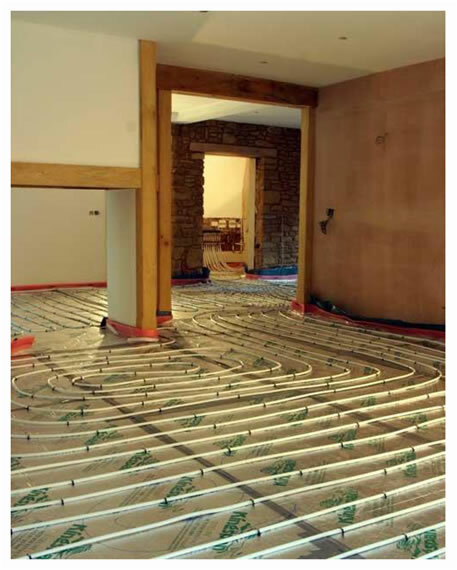 When considering using a heat pump it is recommended that under floor heating is installed in your house. The simple reason is that it is the most efficient way to run your pump. Heat pumps have a capacity to heat water to about 55 degrees which rules out conventional radiators as an option as it needs at least 60/70 degrees to be efficient. It is recommended that there is at least 100mm of insulation laid underneath the pipe to reduce any risk of heat loss from the circulating hot water to the ground especially in very cold periods when the ground temperatures peak. Unfortunately carpets are the least efficient as the act as an insulation barrier. No concrete will be poured unit leak test is complete.